by Christopher Beaubien • December 16, 2008 • Start the Discussion! 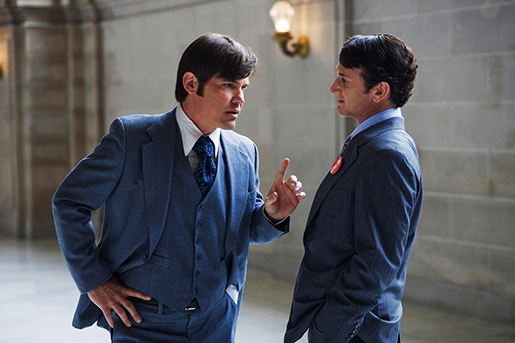 The passing of Proposition 8 across the United States two weeks ago adds more urgency to the new Gus Van Sant film Milk. It is a red alarm crying out against the continued and criminal persecution of homosexuals. Denying the civil rights of an individual to legally marry a person of their choice is cruel. For decades, sanctimonious hypocrites have relentlessly imposed their prejudice on homosexuals, forcing them to live in the margins of society. Homophobia has always puzzled and irritated me. When I was seven, before I was aware of gays and lesbians, I casually wondered if there were men who loved men and women who loved women. Later I found out my musing was correct – and like looking up at the sky to see birds were flying up there — I was cheered by the prospect. As a level-headed straight man, I support and empathize with good people like Harvey Milk.